So, before it’s ancient history, here are my April Favorites. Let’s start on the left…. First up we have Bonita – Made to Envy. 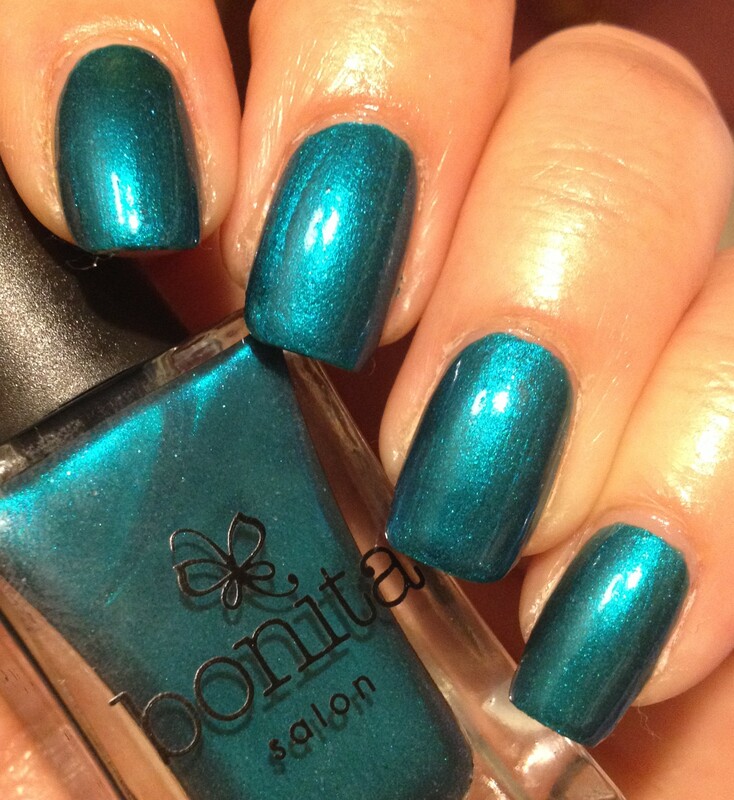 It had been ages since I had purchased a Bonita Polish. I used to buy them on occasion at Francesca’s when they used to carry them. That was maybe 4 or 5 years ago. Within the past year or so, I’ve noticed little Bonita displays in Kmart and Rite Aid. I’ve seen at least 3 different bottle shapes, which is sort of unique for a nail polish line. Anyway, I had been eying Made to Envy for a few months. I’m a real sucker for teal polishes. 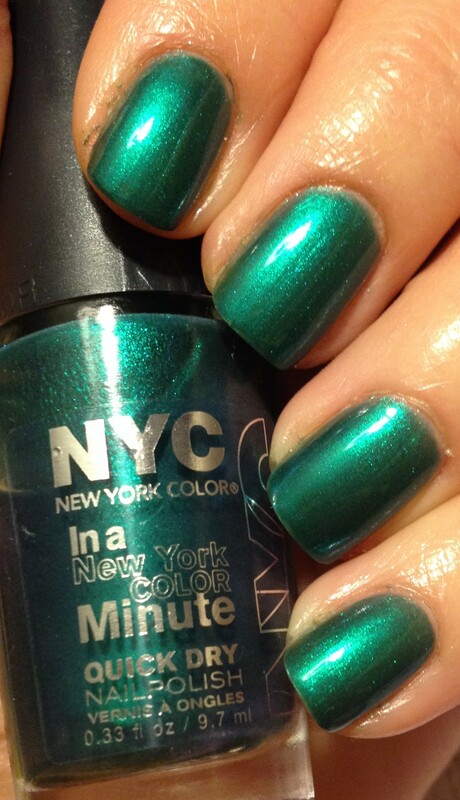 I have a good half a dozen shimmery teal polishes, so I had been telling myself that I didn’t need this one, too. I can’t remember exactly how or why or when I finally caved and bought this, but am I glad I did! the thing that makes it unique to my collections is that it is a one-coater! And the color is just so rich and beautiful! And it’s only $2.49, so I’d definitely recommend picking this baby up, if you can. Just for comparison, here on the left is NYC – Precious Peacock. Although it looks much more green in this picture than Made to Envy, they really are super close in color in real life. This is four coats of Precious Peacock. Four coats. Ain’t nobody got time for that. Back to Made to Envy… It’s just so pretty. Sometimes I just hold this polish and stare at it lovingly. P.S. My hubby really likes this one. Next we have NYC Prospect Park Bloom. After wearing a lot of bright polishes, I was craving something neutral. This one was in my untried stash. This polish is pretty sheer, so I think this took 3 coats. I just love how shiny it is and how soft the color is! 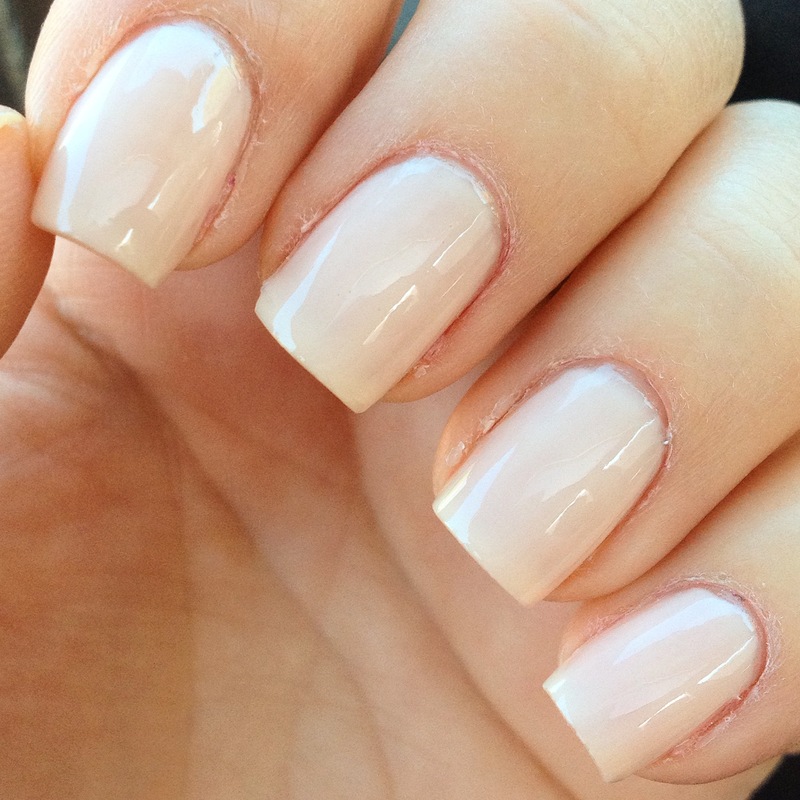 Neutral colors like this are really forgiving if your application isn’t perfect. Heck, there could be all sorts of polish gunked on my cuticles, but you wouldn’t even be able to tell. The best thing about colors like this is you really can’t tell when they start to wear or chip a little. I’m not sure how this polish would look on someone with darker or more olive-toned skin, but if you are a bit on the pasty white side like me, this will work well for you. Next is Fresh Paint – Honeydew. Really, I’m kind of embarrassed to even put this polish in my favorites. This was in both my February and March favorites. When I’m looking to pick out my Monthly Favorites, I don’t really look at (or remember) what polishes I picked the month before. I just look back through my instagram account for the past month and pick out the polishes that I really liked and/or used a lot. Apparently, I’ve been fixated on this polish for at least 3 months. I specifically picked it as an April favorite because I used it for both of my Easter manis. 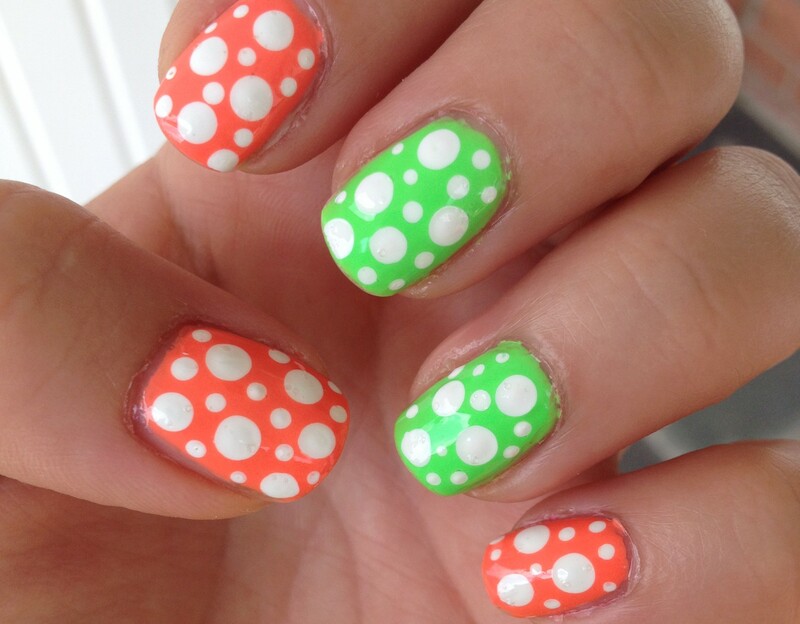 This polish is one of those neon pastel type colors that is all the rage these days. I realize that this polish is exclusive to Five Below, which is not really convenient for lots of you. Sorry about that. Next up is NYC – Sidewalkers. This is just a plain old grey polish. (I like “grey” better than “gray”. I feel like the spelling with an “e” just looks nicer.) Anyway, I went through a phase 3 or 4 years ago where I wore this polish all the time, but in recent months, it’s just been sitting on my shelf, unloved. 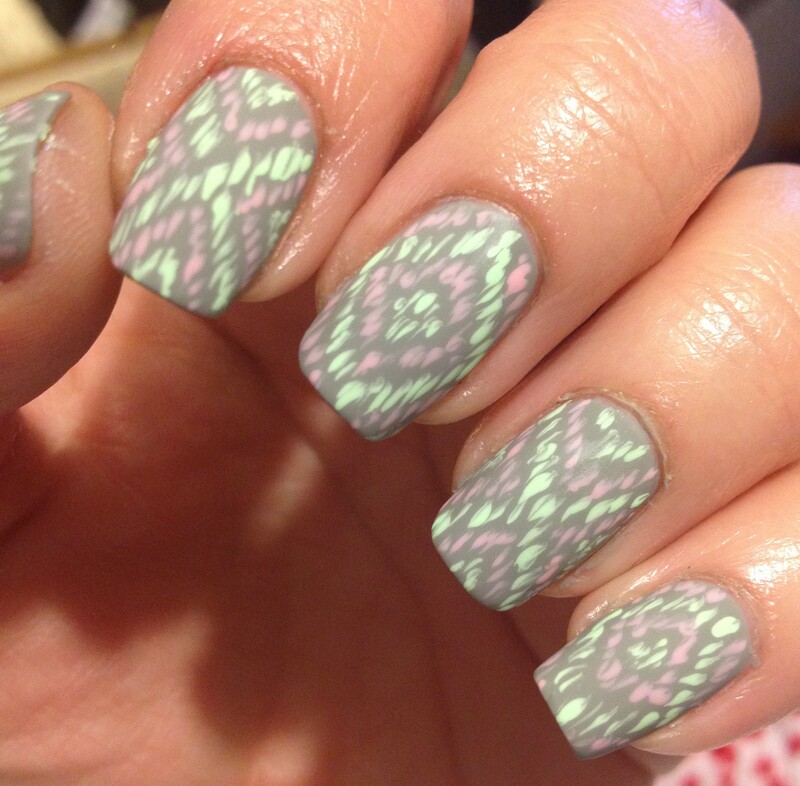 I pulled it out to use as a base for my pastel ikat nails for a nail art challenge (#wnac2015) on instagram. It made me remember how much I like this polish! It’s such a pretty cool-toned polish that works well for pale people. I’m sorry if I’m not much help to you darker skinned people. Maybe I should just do a post on the colors that look awful on my, assuming that would mean they would look good on darker people. Not sure if that’s solid logic or not. P.S. My hubby does not like this color. My final polish China Glaze – Sun of a Peach. That name just cracks me up! 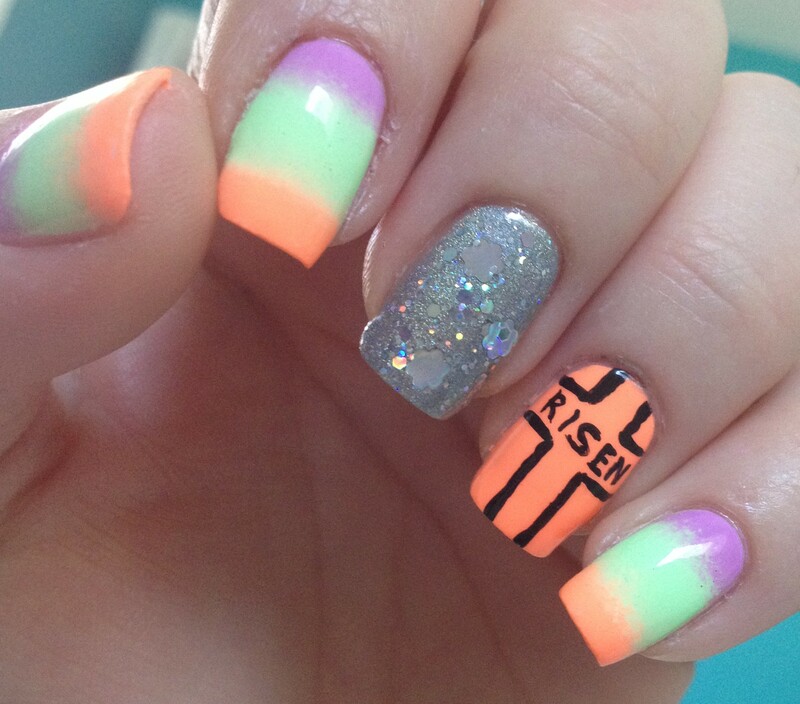 I used this polish in one of my Easter manicures, and it was just so bright and pretty! In general, I can’t really pull of orange, but this shade is one shade in the orange family that I can actually wear pretty well on my nails. I had been wanting this polish for a while, and I found a little mini bottle at Sally Beauty Supply for like, $1.29 or something, so I couldn’t really turn that down. Mini bottles are just the best, aren’t they? I mean, they don’t cost as much as a full size bottle, they don’t take up much room on my nail rack, and really, it’s a rarity that I finish a full size bottle of nail polish anyway. So, that’s that. Thanks for reading! Seriously, I appreciate all of your comments and “likes”. This entry was posted in Favorites and tagged april favorites, bonita, China Glaze, made to envy, monthly favorites, nail art, nyc nail polish, sun of a peach. Bookmark the permalink. That Made To Envy is gorgeous!